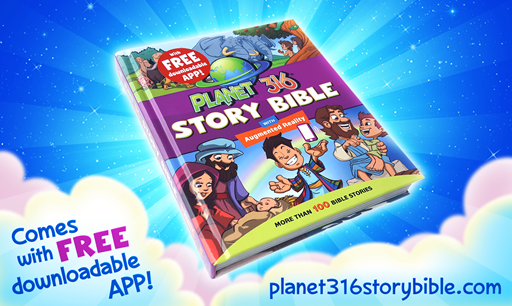 My two daughters received an amazingly well done interactive Planet 316 Story Bible and the companion Planet 316 Story Bible App from Planet 316 and WorthyKids/Ideals. The book’s illustrations are beautiful. The illustrations come to life with the use of the companion Planet 316 Story Bible App. My girls were amazed and delighted, as you can see in the video. My girls loved the stories, even though they were already familiar with all the Bible stories. They read through the whole book in a few days, not because it was short, but because they were returning to it over and over. My 5-year-old repeatedly chose this kid’s Bible to take to her Sunday school. The stories are retold for children (like pretty much every children’s Bible ever, I think). I didn’t see any issues with the way the stories were told. In the video I posted, you can see how my 5-year-old was confused for a second and thought that maybe Eve forgot which tree she wasn’t supposed to eat from. I didn’t think the story was confusing, but you never know with little kids. Here, she was really engaged with the story so she asked questions and we cleared up the misunderstanding. I’m not sure of the reading level of this book. My 5-year-old can’t read it on her own, but my 7-year-old is a very good reader for her age and could easily read it. You might notice that my younger daughter is quite the little busy bee. Yes, that’s her usual energy level – but this Bible held her attention very well. You can see her giant “thumbs up” at the beginning of the video. The app worked flawlessly. My girls were able to make the pictures come to life with minimal fuss and zero instruction. We tried the app on a newer iPad mini and on an Android phone. It was easy to download the free apps, and both worked immediately and easily. My phone warned me that the app was larger and should be downloaded over wireless. My girls preferred the iPad mini over the phone because it’s easier to see the pictures on a larger screen, but when we were on the go and my 5-year-old wanted to bring along the Bible, it was nice to have the option on my phone. It’s harder to describe how the app works than it is to just show you how the app works, so take a look at my video and see. Parts of the pictures “pop up” out of the book and can be tapped on the screen to say things. I know that people look for the best giftable children’s Bibles so they can give a cherished gift. This is definitely a top giftable Bible for me now! I think any child would love hearing the stories and seeing the pictures come to life.